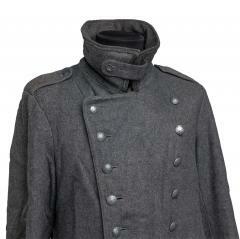 A true classic from ages past, the M22-36 greatcoat had its moment of glory during the Winter and Continuation War. 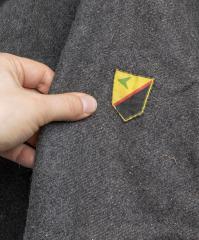 Real deal piece from war years, made of coarse wool with linen lining, complete with pretty strong stamps. 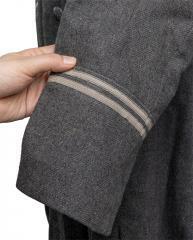 Lieutenant's stripes on the cuff. The caot might be shortened a bit, as was usual during the war. One-off piece! Marked "Int 42, ***KESK.PUKIMO O/Y". Means it's from 1942. 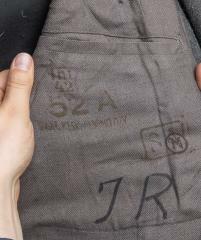 The size is officially 52A, which means about Euro 50 Short (US 40S): by taking into the account the proper fit of this type of garment, we could say this one is made for a gentleman who's about 172 cm tall and has a chest circumference of 100 cm and about 88 cm waist circumference. 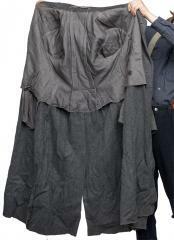 Sleeve length from shoulder seam to cuff is 64 cm. 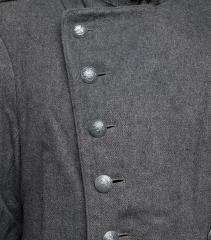 In very good shape for its age, with just some general wear and fading. If this one is shortened, it's done pretty neatly.